Over the years I have made quite a few hats for my family and friends, and my mother has the biggest collection. So I didn't take many with me on my recent holiday, but instead planned to borrow some of those! 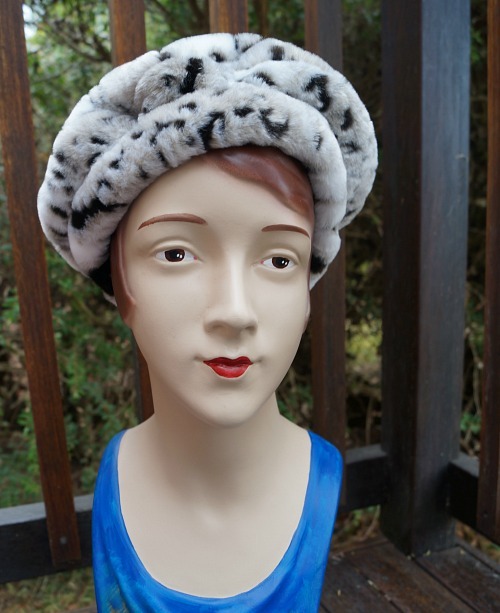 My favourite was a small black felt hat with felt feathers and a snow leopard fur trim. I enjoyed wearing it so much, I decided to try some similar styles again. I would be wearing this hat right now if I hadn't accidentally made it a bit too small for me! 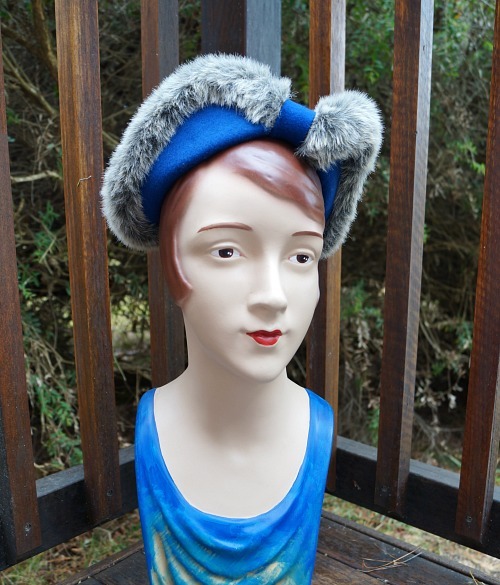 Instead it has gone, along with the rest of the hats in this post, into the Blackheath Hub with the berets for my first restock of winter. I tried again with red and black, but I don't love the black faux fur on me. I guess I'll just have to make another one for myself! 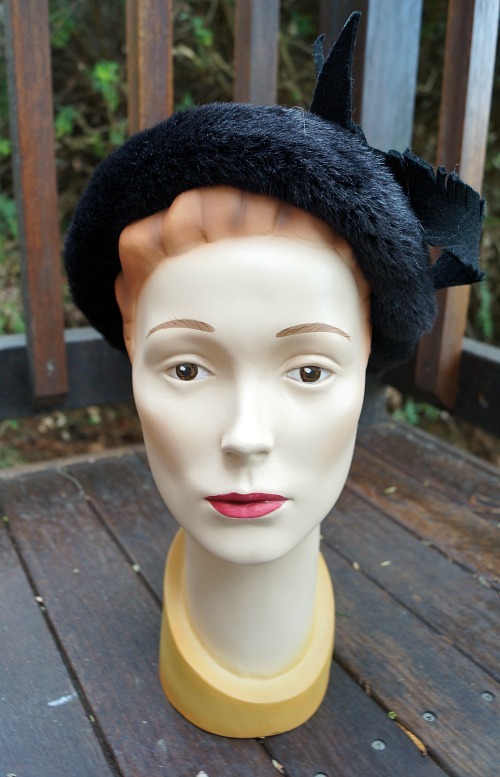 Something that is so lovely about vintage hats is how different they look from different angles. This is particularly noticeable in those that sit on the back of the head, as these do, and create a frame around the face, with hidden details at the back. In this case, none of the red is visible, and it creates a nice bright surprise as you turn. This next one I have mixed feelings about. I was going for a sort of heart-shaped halo effect, but I think I've arrived at fluffy tricorne instead. What do you think? 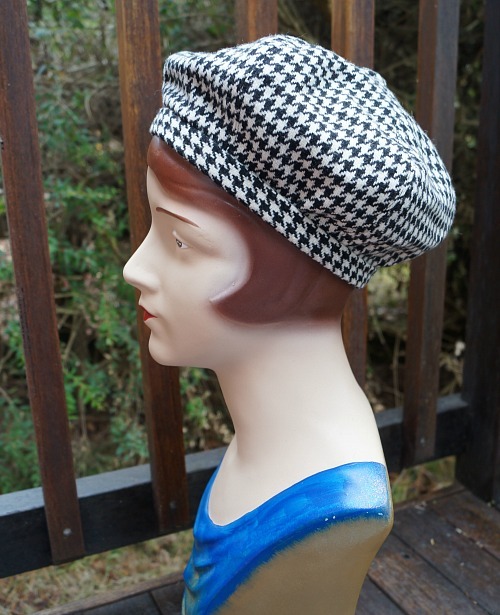 While those experiments had their ups and downs, it is hard to go wrong with a classic cloche. 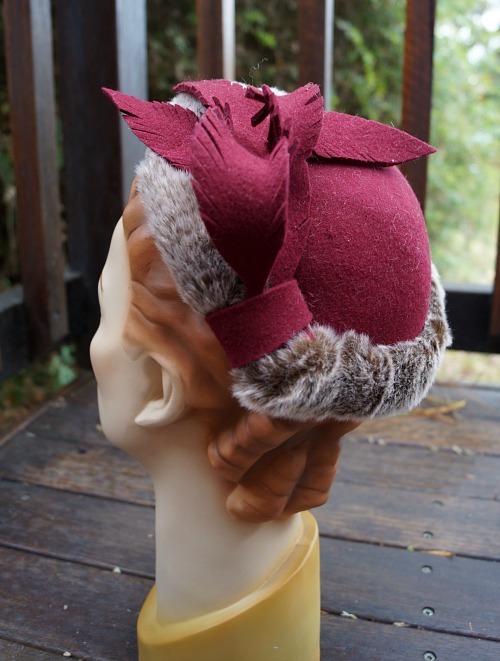 There is so much inspiration to draw on, but a swept back brim and velvet ribbon is hard to beat. And the dove grey vintage wool felt was lovely to work with and is such a subtle and classy colour. This next was a design challenge, since the orange felt hood already had a bit cut out of the bottom (to make the visor on Nicole's 1960's rainbow helmet hat) and I don't work with orange very much either. 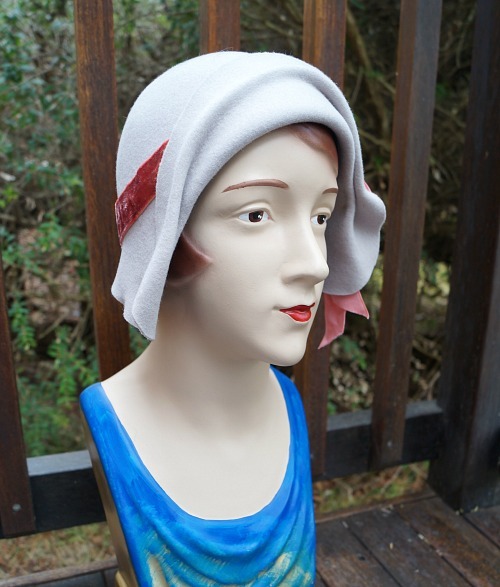 So it had to make a small hat, leaning towards the 1930s in inspiration, with bow details I saw in a late 20s illustration. 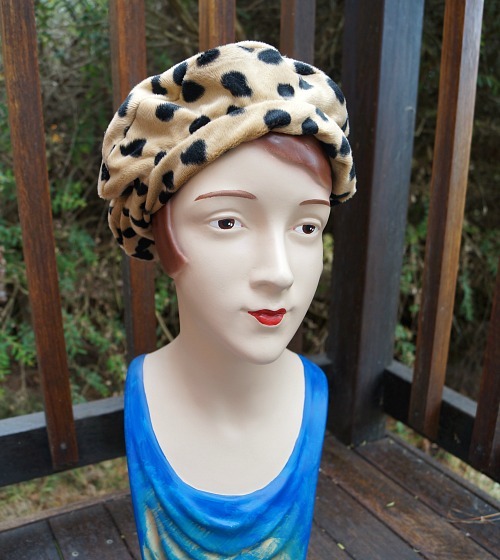 This type of hat often doesn't look like much on a mannequin, but is really flattering when worn. It might be the hair that makes all the difference. Hopefully I'll manage to borrow them back from the shop and do a photoshoot so you can see them looking their best. Actually, I hope they sell out before I get that chance, but the photoshoot would be a nice option too. Although these hats are in the Hub now, non-locals feel free to contact me to ask about prices or about having something similar made. 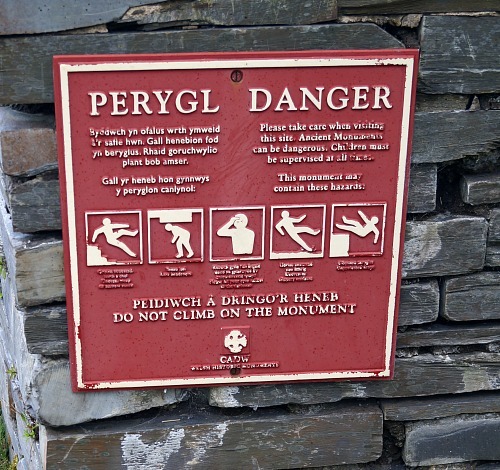 Today we have more of my Wales adventure, although actually all of these holiday images were taken in England. Never mind. On my trip, I made time to meet up with two friends, and we found fun interesting places partway between our locations. First, I met my friend Zoe, who I went to primary school with in England, some *mumble mumble* years ago. 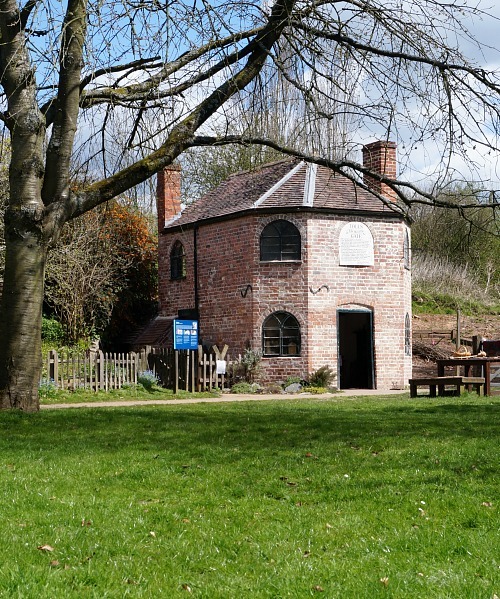 We met at the Avoncroft Museum of Historic Buildings, in Worcestershire. 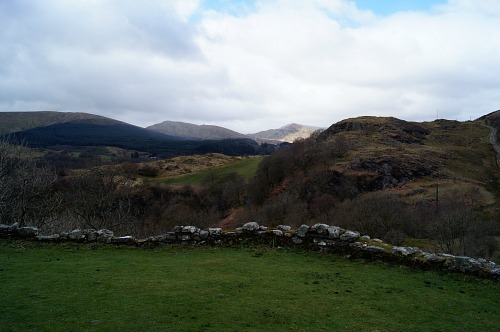 It was only a bit over an hour from my base in North Wales, and it is a delightful place. Basically it is a large plot of land full of relocated historic buildings (and bits of them, like a collection of chimneys and a church spire) that could only be saved from demolition by moving them, mostly out of the path of motorways. 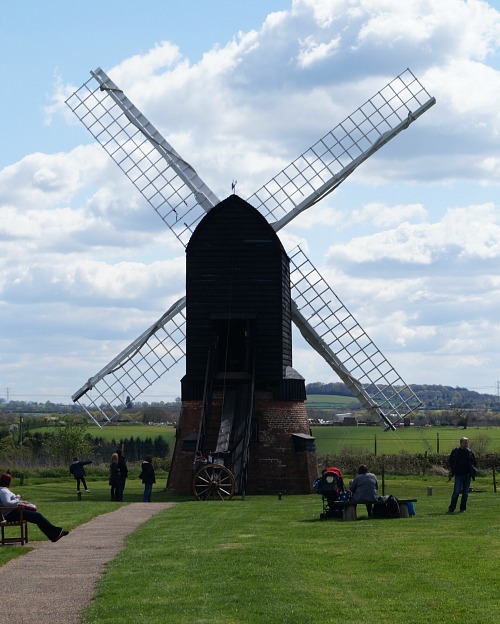 Along with the windmill and toll house you see here, were an Elizabethan cottage, a dovecote, a counting house, and an Edwardian building that was now the tea rooms. It was St. George's Day, so we also got to encounter the knight himself, and a dragon on stilts. Teacup wasn't quite sure at first, but then all she wanted to do was find the dragon and stare at him. 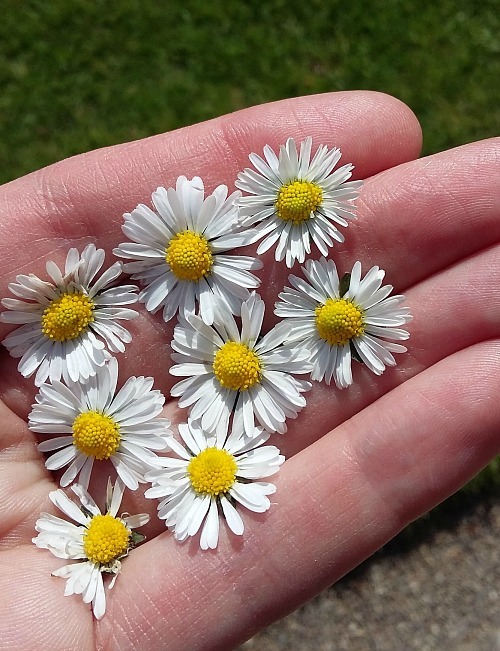 Oh and pick daisies, of course. The museum also houses a collection of telephone kiosks. Some of them are connected by their own little exchange, so for 2p you could call your friends in the other phone boxes, which is pretty cute. 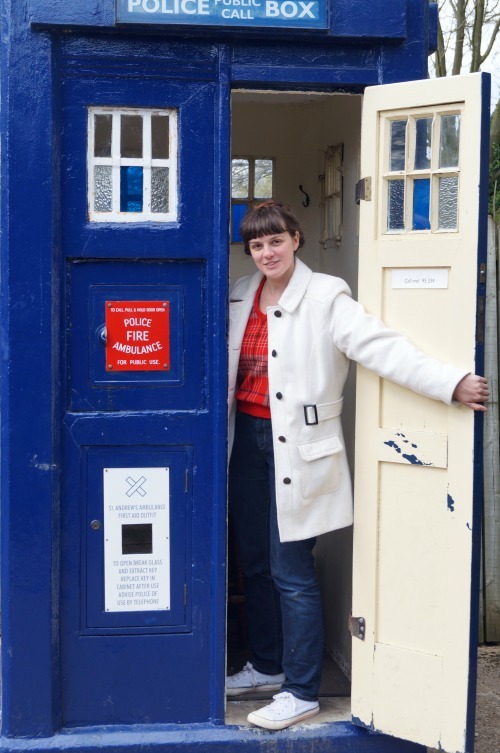 And sadly this was the least stupid face I made in the Police box, but I had to include it anyway. The second meet up was with an online friend who you may be familiar with. I got a bit brave for my shy self and contacted Kate-Em to ask if she wanted to hang out, and we spent the day at Dunham Massey, a lovely National Trust Estate in Cheshire. 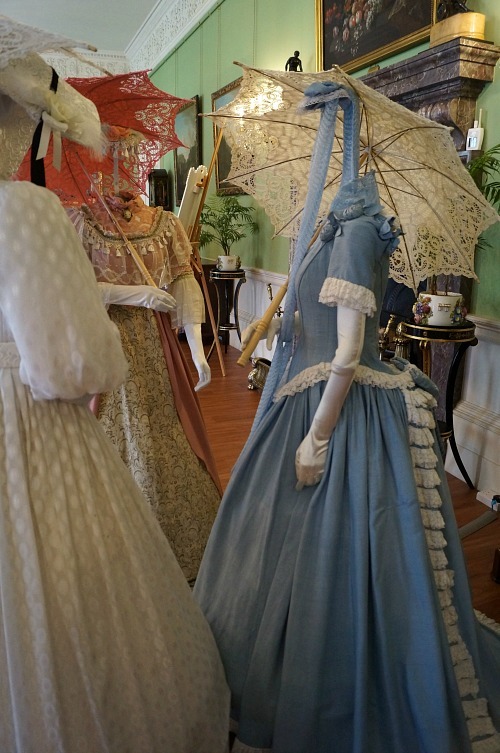 The current exhibition related to the scandal surrounding the marriage of the 7th Earl to a circus performer in the Victorian Era, so there were some pretty clothes. In fact, most of the photos I took were of the pretty clothes. I'm sure you won't object. It was the details I was obsessed with, like these fabric roses along the shoulder here. Aren't they so charming? And lace. Lots of lace. 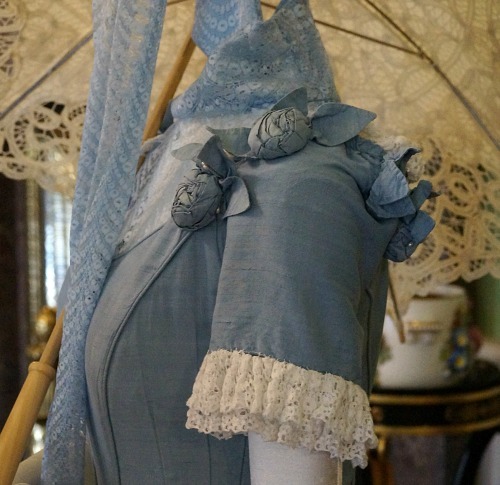 The Victorian ladies knew what they were doing. 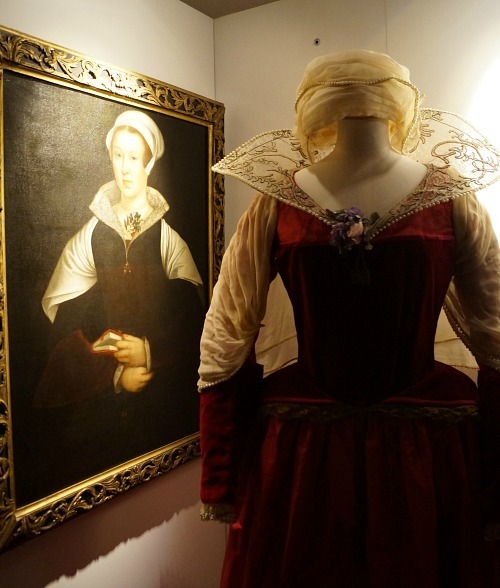 Which was mostly shunning circus performers who had the audacity to marry wealthy single earls. 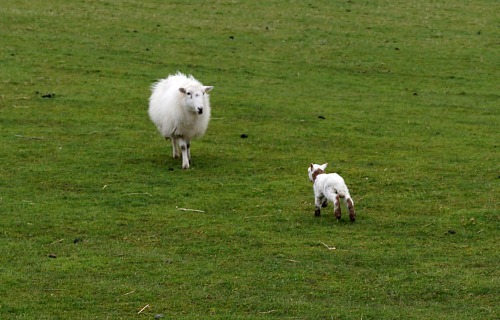 The reception from the locals was so chilly that the Earl and his wife left Dunham Massey, and it was down to a later Earl to bring it back into order. Which the 10th (or 9th? I'm not sure) Earl did in the 1920s, including buying back at auction as much of the artwork, silverware and so on that had been sold off in the meantime. I wish I could buy back all the family treasures that have been gotten rid of by my ancestors! Where is that hat pin collection...? I had a super time with Kate-Em, who is not only incredibly lovely but has some almost-eerily similar experiences in life, and career in particular, which led to us talking on and on until they started to pack up the cafe around us and Teacup fell asleep in my arms. We didn't even get to the gift shop! And you can tell we are neither of us fashion bloggers because even though we were both wearing things we had made ourselves, we didn't get any photos of either of us. 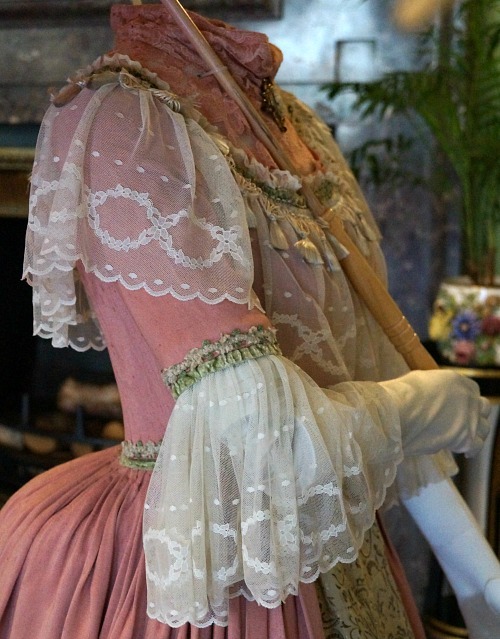 But I got a photo of this outfit, which is actually a 1920s fancy dress costume based on the painting shown. That's probably better. I can only think of one important question to close on here. Those shoulder roses, right? Right? Who wants shoulder roses? As you might remember from her part in the Sisterhood of the Travelling Hat, my Mum lives in Wales, and I mentioned in an earlier post that I would be visiting her this year. Well, we have been, returned, recovered from jet lag, and fumbled our way back into our regular routines. 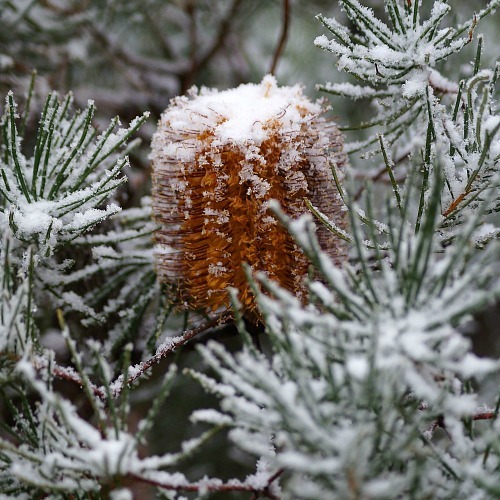 It was Spring, and a not unpleasant mix of cold and sunshine, with a generous sprinkling of lambs, daffodils, and blossoming cherry and pear trees. 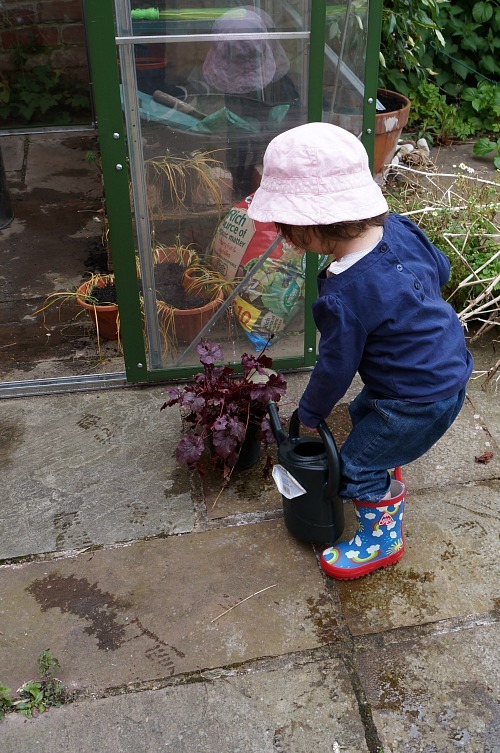 Teacup had what might be the time of her relatively short life so far, learning to water plants, eating oregano straight off the plant, picking all the daisies she could find, playing with cats, and so on. My husband and I pursued our separate interests while he was there, with him mostly launching himself at high speeds down things, like mountains, white water and zip lines, and me mostly enjoying scones. 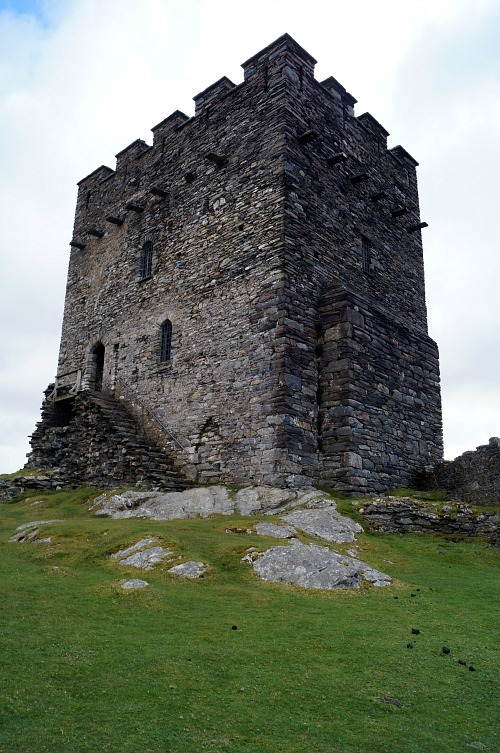 We only visited one castle, Dolwyddelan, which was on the way to Blaneau Ffestiniog, where he had a date with an underground zip line. Still, the castle was cold and windy, and there are at least five ways you can injure yourself on it, apparently, so I guess everyone was happy! Rather than overdose you all with holiday snaps (not that I took that many, actually, as I was having too much fun relaxing and enjoying things and only occasionally remembering to pick up my camera), I'm mixing it up with some hats. On a theme though! When I last visited, almost three years ago now, we discovered the Trefriw Woollen Mills, and I came home with three short pieces of gorgeous wool tweed. Which sat around waiting for me to have a design worthy of them. Which had to be very good, because this was lovely, expensive stuff, as well as being meaningful to me, and not something I could just pop over and get some more of any time I wanted. 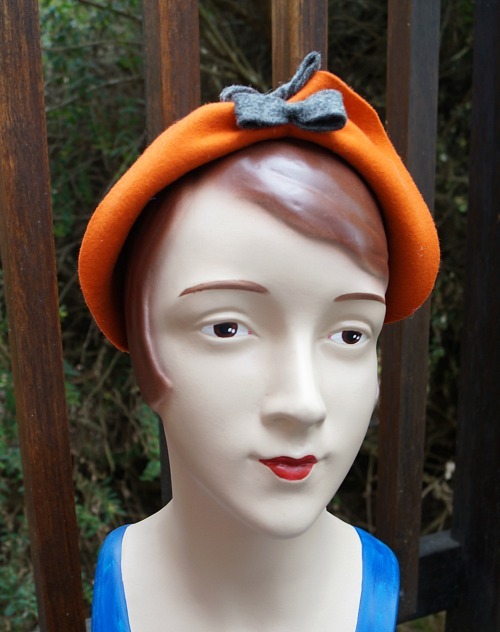 Except that the years rolled on and I had actually popped over to Wales again before I had cut into two of the three colours (I made some of the brown into the "small chic beret"). 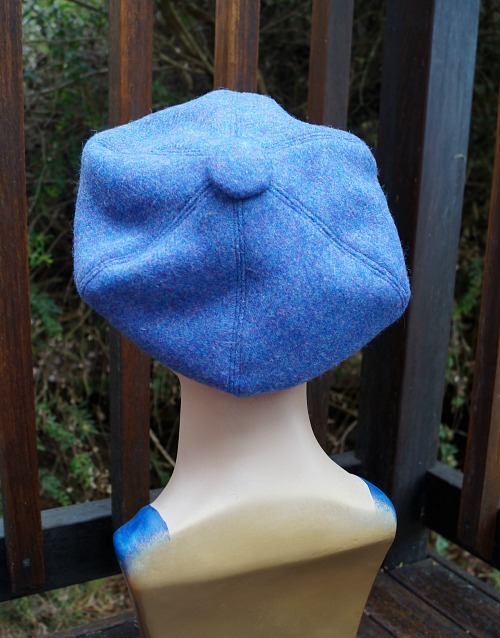 So I decided that one of the first things I would make when I returned, would be a beret with one of my Welsh tweeds. I don't feel the photos do the variegated colour of this fabric justice, and I'm still deciding how I feel about my beret pattern, but I'm glad I've used at least some of the good fabric. And I did buy more! 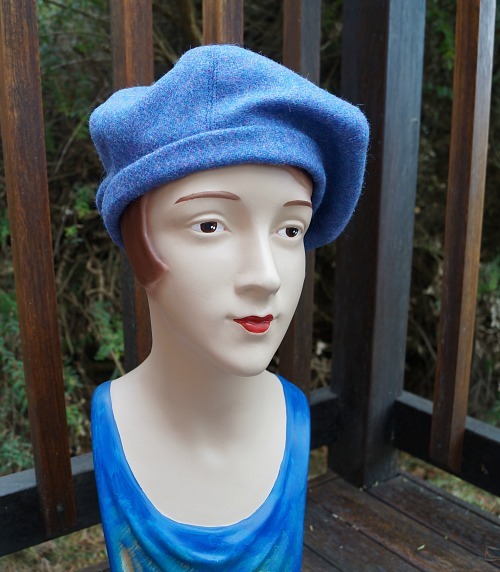 Berets have been one of the themes of my winter restock at The Blackheath Hub, and I'm happy to say (relieved, really) that they are all from fabric I had in my collection already. Because I really don't need to be buying more fabric! Using up this snow leopard faux fur is one of the great ongoing missions of my life, having some time in my youth decided to buy three metres of it. Hmmm. It's lovely, but it sure takes up a lot of space. 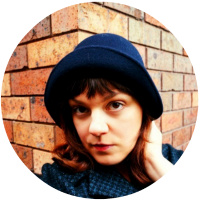 I love berets, and my own red one is a go-to everyday hat for me. This hounds-tooth below is also from an old coat, one that I picked up in an op-shop. You can't go too wrong with black and white, or with hounds-tooth wool. 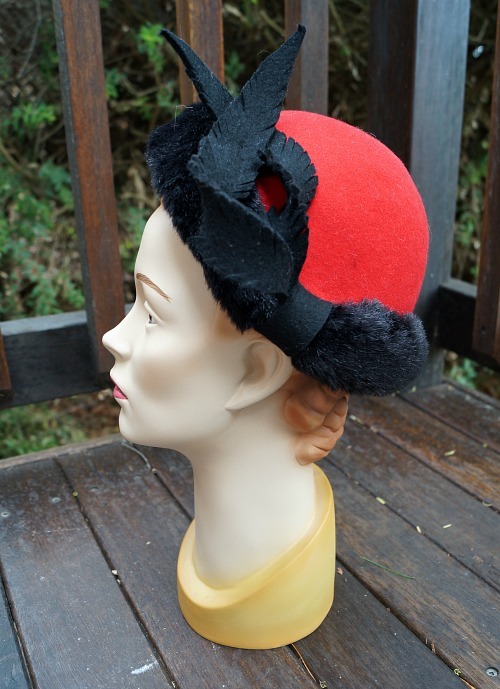 I made a mix of the classic "French" circular berets and ones with a 6-panel crown. 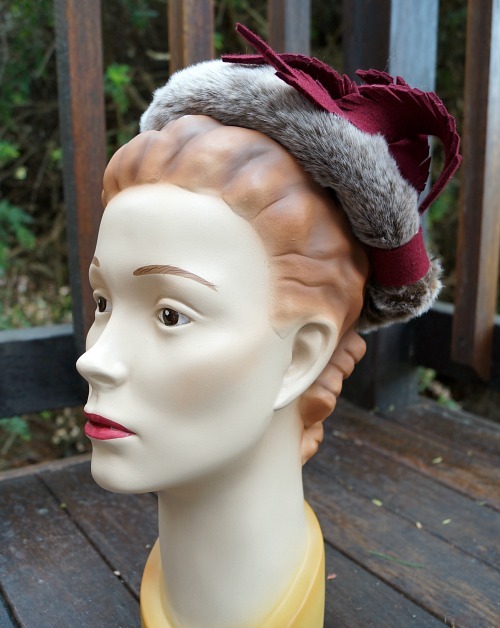 I think in general I prefer the sectioned crown, but it certainly wouldn't work for the faux fur! I tried the cheetah print in both. 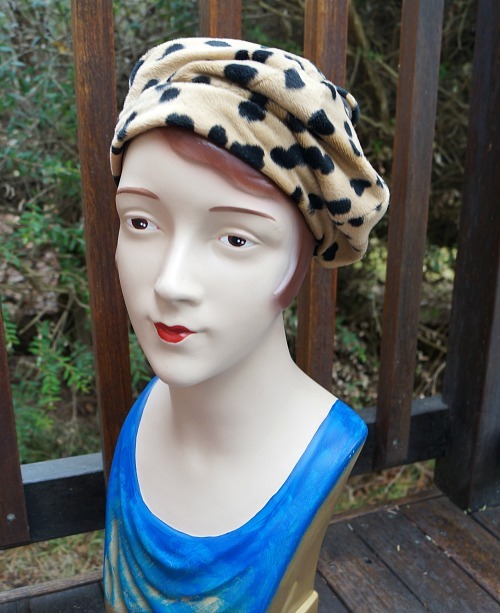 That's another one that has been lounging in my craft room for many years, having appeared before as a 1960s style hat. I've almost finished with that fabric and I'm thinking cheetah print butterfly cap for the last of it. More of my quiet Wales adventures and more winter hats to come! 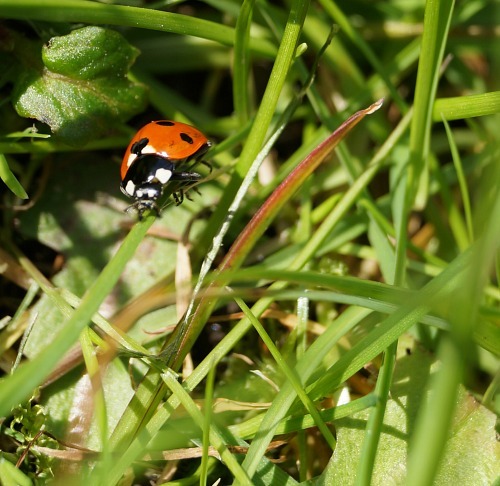 Are you an adventurous holiday maker or more into relaxation and inspiration like me?